When you connect your originators to your MLS listings, you help the home buyer better understand affordability – that means better qualified buyers that close faster! More time on page. When RatePlug is embedded in your listings, homebuyers spend more time viewing your property listings. That means better informed buyers! Engage active buyers. RatePlug connects the agent and originator to the MLS and the home buyer who is ready to buy – not just browsing. Why Pay for a Separate Flyer System? RatePlug’s property flyer system is included with your MLS membership. Generate custom property flyers right from the MLS with your lenders’ rates and products displayed. Multiple flyer layouts and colors to choose from. Monthly affordability embedded in flyers (includes PITI and HOA). The system also streamlines social media posts with property specific affordability calculated for every MLS listing. Request a flyer from your lender. Post your listings with mortgage information in social media. View special financing options available for your properties. Far too many closings fail due to financing. Protect your time and effort by engaging a trusted lender that uses RatePlug to help you close faster. 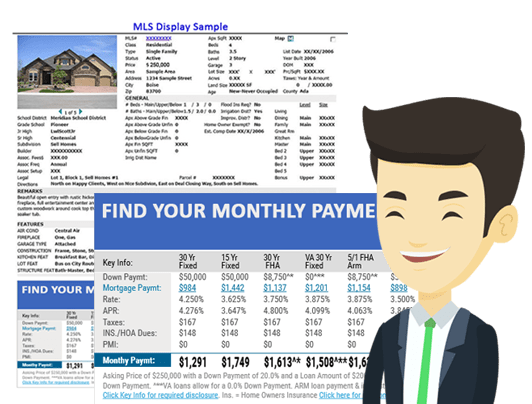 Unlike typical mortage payment calculators, RatePlug leverages the full property detail available within the MLS to calculate monthly affordability. This monthly cost to own includes the full PITI, HOA, and other costs based upon multiple financing options. When the homebuyers say “we can afford that” – they are more likely to make an offer.